An auction to benefit the street children of Oaxaca will open online March1, 2009. Please visit Create With Moxie for information and view photos of the shrines. Please join a wonderful artist and friend, Rebecca Brooks in her effort to help the street children of Qaxaca. A bit of eye candy for those of you that like jewelry. I have been busy creating a line of jewelry for an upcoming Trunk Show in Fort Collins, Colorado. Some will soon be featured on my Etsy gallery. Visit the gallery here. Congratulations to the winner of OWOH 2009 event. The winner is KATHY...the artchic from Colorado. Please email me your address so I can send you the necklace. Kathy has till Feb. 15 to respond before another number is drawn. Students of all levels are invited to attend a NEW CREATE WITH MOXIE MIXED MEDIA WORKSHOP SERIES starting in March 2009 in Fort Collins, Colorado. 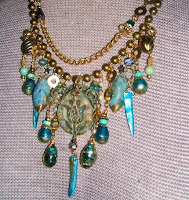 Cory will also be teaching a BEAD AND FIBER NECKLACE class along with a TRUNK SHOWING of her jewelry designs. More information here and here.